What could be better than 2 of my most favorite foods together ? 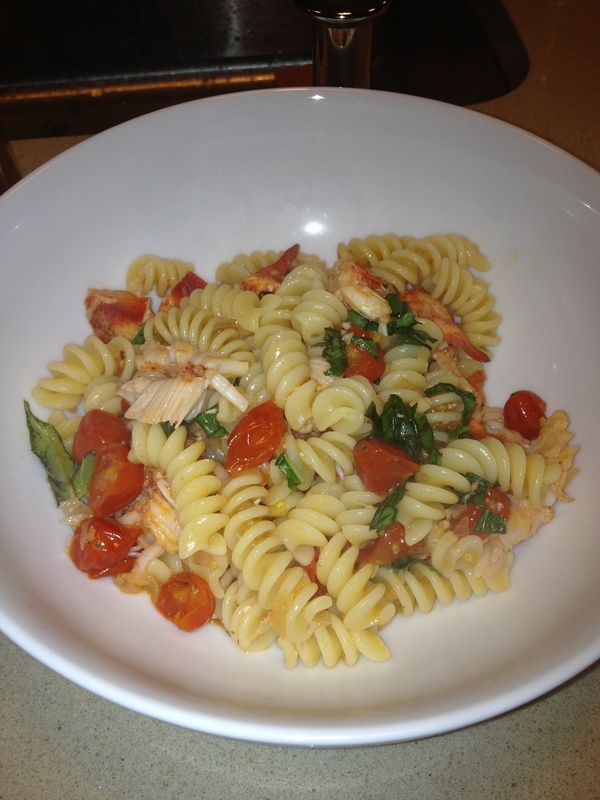 Lobster and Pasta and no wrangling with a messy lobster, just yummy lobster meat and tomatoes with pasta. 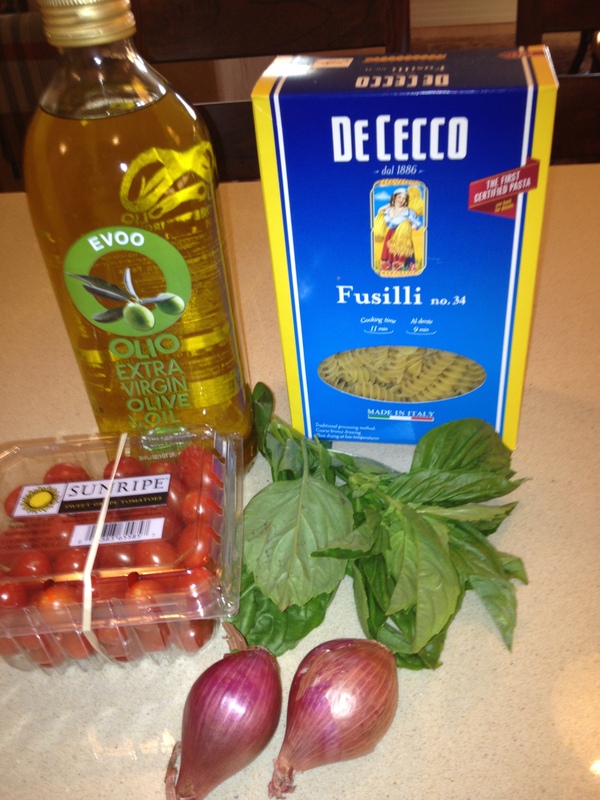 I just adore this combo and while it may be a tad rich there is no heavy sauce just delicious fresh ingredients. I picked up the lobster meat at Grace’s Marketplace in Greenvale and I also use Roslyn Seafood Gourmet on Willis Avenue. I call ahead because they don’t always have it on hand so you may have to order ahead of time. I got this recipe from the NY Times Wednesday dining Section and made a few adjustments to my liking. It is perfect for the summer, winter, spring or fall. I actually think it’s a perfect way to serve Lobster and the lobster goes pretty far in a recipe like this. * 4-6 servings, or increase ingredients and make it for more. 1 lb. pasta such as bucatini, lasagnetti, rigatoncini, or long ziti, macaroni or any sturdy type pasta. app. 2 cups chopped cherry tomatoes or little grape tomatoes if you can find yellow tomatoes mix them in with the red tomatoes, I used a whole container , I sliced in 1/2 . 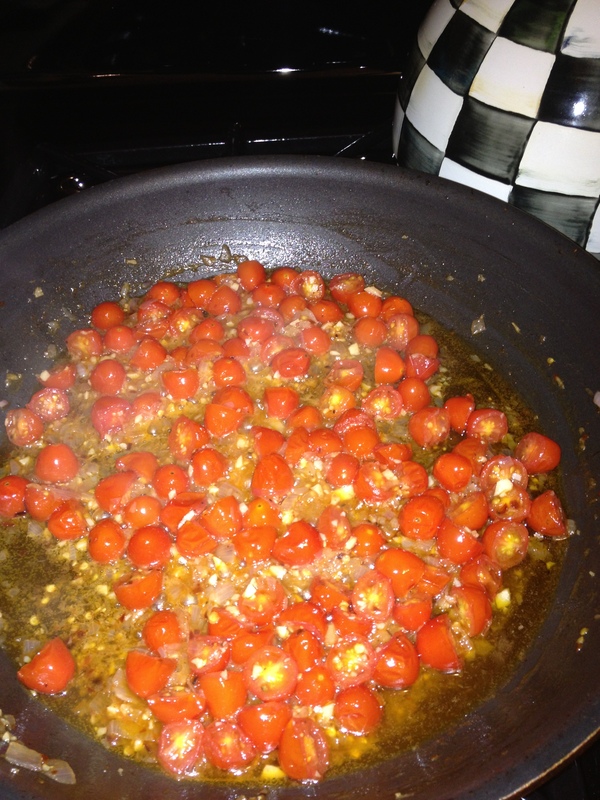 –I put 1/2 teaspoon of kosher salt and a few grinds of the pepper mill on tomatoes. I added a teeny bit more salt, you’ll have to taste for it –taste a piece of tomato and you’ll know if you need more salt and pepper. app. 2 handfuls basil leaves, torn or roughly chopped–obviously this adds a bit of punch to the plate but not entirely necessary. Bring a pot of well salted water to a boil and cook pasta according to directions for al dente. Pour olive oil in a wide skillet over medium-high heat. Add shallots and cook for a couple of minutes till shallots soften without browning. Add garlic and red pepper and cook down for another minute or so. Add tomatoes and season generously with salt and pepper, I like to break down the tomatoes a little, so I cooked for about 15 minutes. 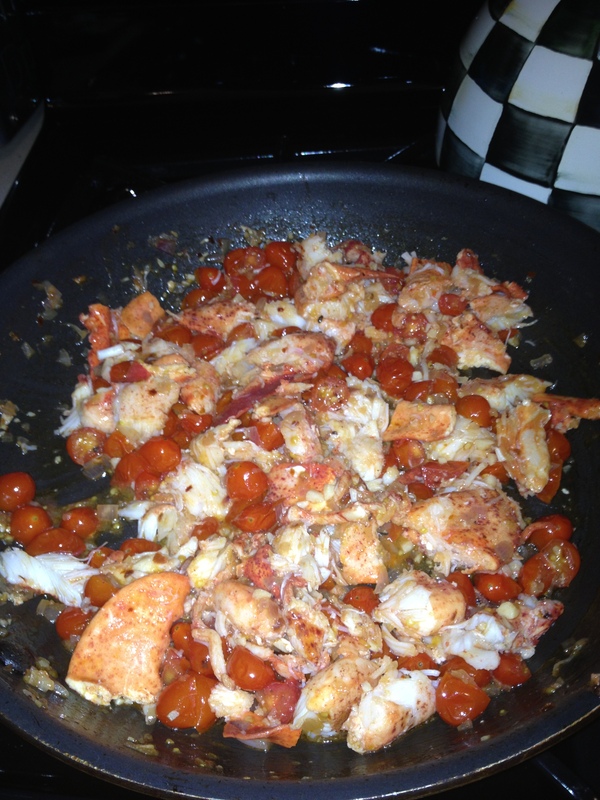 Add lobster meat to skillet, stir to coat and heat through for another 5 minutes. Turn off heat until pasta is ready. When pasta is al dente, drain, add to skillet, and season with salt and pepper. Toss well and transfer to a wide bowl or platter. 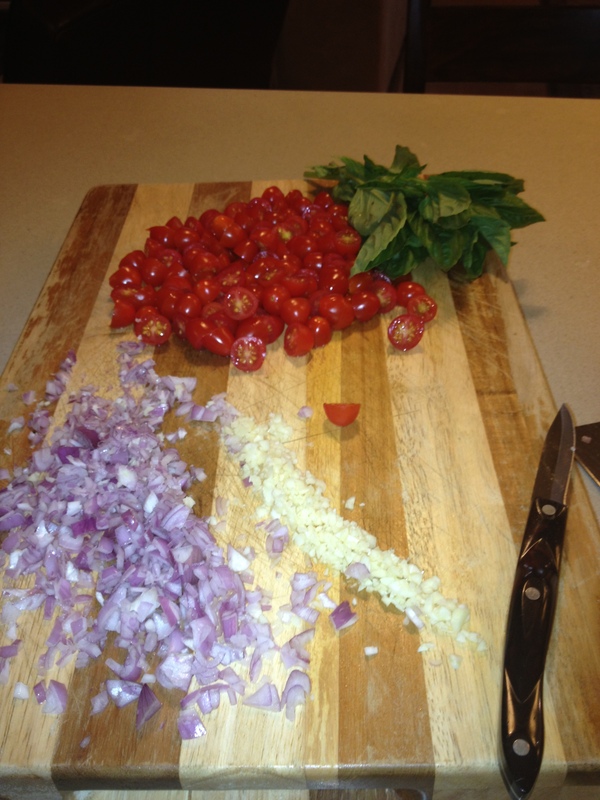 Add basil, toss once more and serve immediately. Keep a little pasta water on hand if you need to moisten pasta. This was amazingly delicious, and what the hey we’re worth it right? 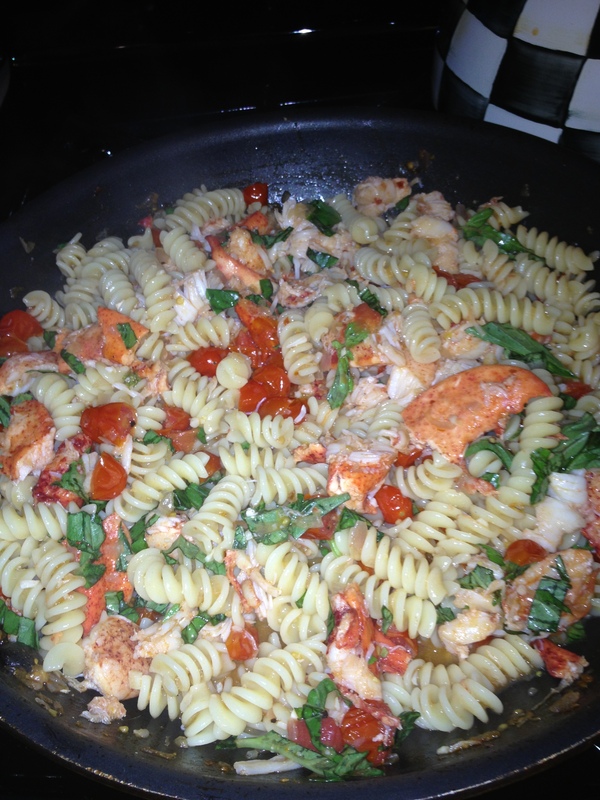 This entry was posted in lobster, pasta and tagged Lobster, Lobster and Pasta. Bookmark the permalink. thanks I will have to make soon.